This easy mug rug project is perfect for teaching beginning quilters and sewers basic piecing and machine quilting skills! Cut fabric into perfect squares and rectangles. Sew 1/4-inch seams with a basic straight stitch. Sew small pieces together into the mug rug top. Nest seams to reduce bulk. Layer fabric, batting and batting. Finish the piece with simple machine quilting. Class includes complete, downloaded pattern to make the Easy Patchwork Mug Rug. 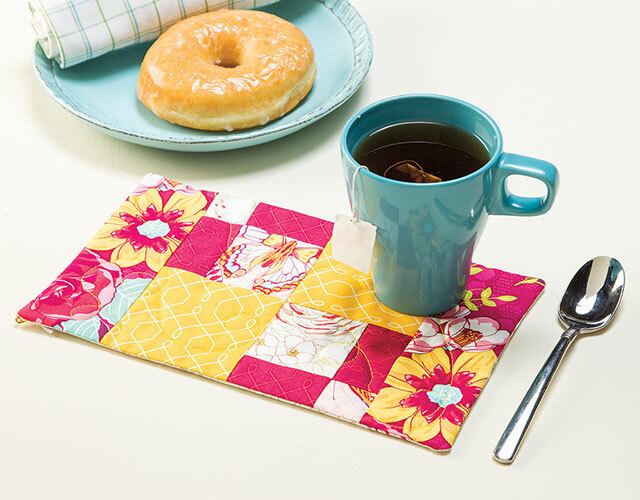 Once you're finished, you can sit back with a cup of coffee or tea and enjoy your new mug rug! I found this very helpful and completed my first mug rug. Her instructions were easy to follow. I will be making some more for sure. I really enjoyed this video. Nancy's instructions are clear and easy to follow, and the camera was good at doing close-ups where needed. I am pleased with my finished product and look forward to making more! I am pleased with this video, I think I will use this pattern and all different fabrics to make mug rug gifts. Basic information presented in a cheerful, friendly way. I especially appreciate the attention to the details of seam matching and whip stitching. The Mug Rug class inspires confidence and gives skills needed to adapt your own ideas for other projects, using this patchwork system. Thank you, Nancy McNally! Easy to understand and follow video. Good pattern cutting descriptions and cutting instructions.